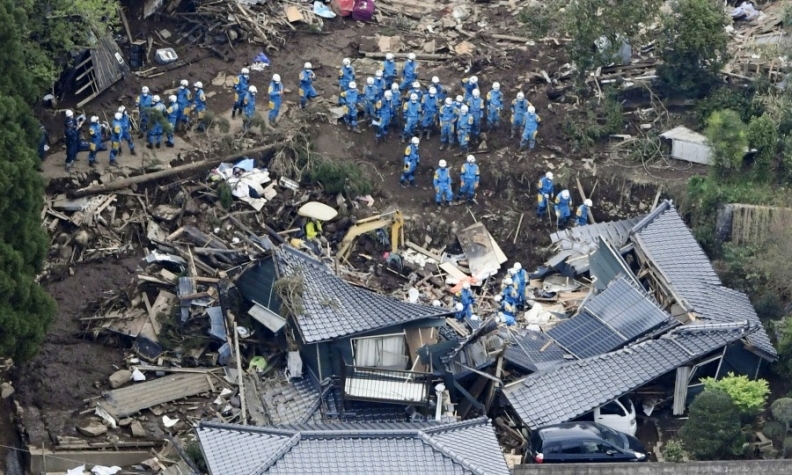 Rescue workers serach for survivors in Minamiaso, after a series of earthquakes hit southern Japan. TOKYO -- Toyota Motor Corp. may see its operating profit reduced by about 30 billion yen ($277 million) for the current quarter after a series of earthquakes struck southern Japan and disrupted parts supplies to the world's largest automaker, an industry analyst said today. Toyota's loss of production may reach 56,000 vehicles for Toyota and Lexus and 7,500 units for minicar maker Daihatsu Motor Co., Koichi Sugimoto, a Tokyo-based analyst at Mitsubishi UFJ Morgan Stanley wrote in a report. The 30 billion-yen estimated impact to operating profit may linger into the second quarter through September, he said. Production shifts stopped late last week at Toyota's Kyushu factories and will extend to other Japan assembly lines in stages throughout this week, Toyota said in a statement. Japan's most devastating earthquakes since March 2011 began striking the southern island of Kyushu on Thursday and have halted some engine and parts production for Aisin Seiki Co., chip manufacturing for Renesas Electronics Corp. and Mitsubishi Electric Corp. and motorcycle output for Honda Motor Co. The earthquakes will test the business continuity plans that Toyota and its Japanese peers drafted after natural disasters hit the nation's east coast five years ago and disrupted operations for months. The stakes are high for Toyota because it relies on domestic manufacturing more than its peers. The automaker and its affiliates made more than 4 million vehicles in Japan last year, 40 percent of their worldwide output. Nissan Motor Co. and Honda's shares of auto production from Japan were 17 percent and 16 percent respectively. "Owing to the lessons learned from the Great East Japan Earthquake, the automakers and their suppliers have together built up strong procurement networks for components that can be rapidly restored following disasters," Nomura Holdings Inc. analysts wrote in a report today. "As such, even supposing that production at Japanese automakers is affected for several weeks, we think that they will quickly return to normal and be able to minimize effects" to full-year earnings. Toyota shares fell as much as 6.8 percent and were down 5.1 percent to 5,449 yen as of 11:51 a.m. in Tokyo. The shares have declined 27 percent this year. Aisin Seiki Co. said two plants that make engine and auto parts, semiconductors and other components have been halted since April 14, when an initial magnitude 6.4-level tremblor hit Kyushu Island’s Kumamoto prefecture. Renesas's Kawashiri plant that makes chips for cars remained shut today, with workers unable to check damage inside or determine when operations will restart, spokeswoman Atsuko Arakawa said by phone. Mitsubishi Electric said last week it halted production lines at two Kumamoto factories. Honda has suspended production at its motorcycle plant in Kumamoto since the Thursday quake and is extending the halt to April 22, according to spokesman Ben Nakamura. Nissan's plants on Kyushu Island will resume production today after sustaining minor damage, spokesman Dion Corbett said. Subaru maker Fuji Heavy Industries Ltd. and Mazda Motor Corp. were operating their assembly plants today and checking with components makers about whether their supply chains would impact production. Toyota's domestic assembly lines are shutting down for the second time this year. In February, the company halted factories for one week after an explosion and fire at a plant run by affiliate Aichi Steel Corp. disrupted engine, transmission and chassis component supply.